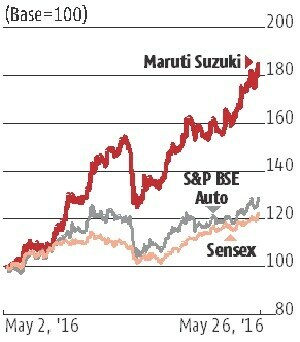 The Maruti Suzuki stock hit its all-time high of Rs 7,091 on Friday. Investors believe a strong response to new vehicle launches and robust product line, especially in the premium segment, will reflect in higher volumes and better profitability. Additionally, an expanding distribution network would help expand its already elevated market share. Given these advantages, the Street expects the stock, up 16 per cent over the past month, to stay at higher levels, as it sees further re-rating. Lack of investment opportunities in the automobile space as compared to Maruti also acts in the stock’s favour. Prayesh Jain, analyst at IIFL, says Maruti is one of a few in the segment with strong earnings visibility. Its robust portfolio across segments, including its premium offerings, has helped it to tap into the growing passenger car demand and gain market share. Given the demand for its cars, the company could see revenue growth of 15-16 per cent for FY18, aided by volume growth of 13-14 per cent and higher realisations, he says. 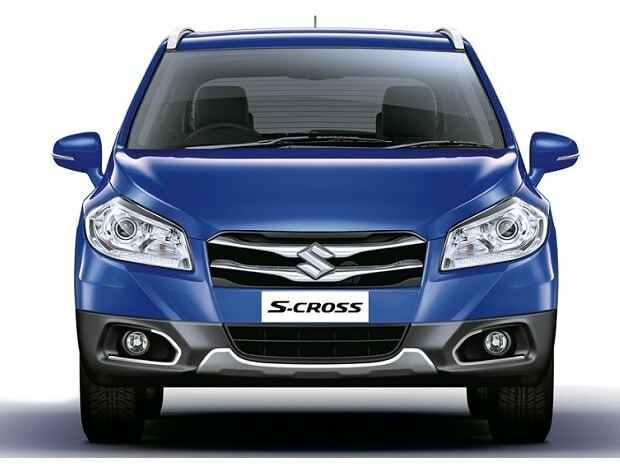 While the company was strong in the small car segment, its past attempts to move up the value chain were not as successful, with the Grand Vitara, SX4, older Baleno or Gypsy launches. This, however, changed over the past three years as its foray into the premium category and utility vehicle space with premium launches (Ciaz, Vitara Brezza, Baleno and S-Cross) saw robust demand. While other automobile makers, with a few exceptions have struggled with new launches, Maruti’s volumes over the past year have been resilient. Scaling up of the Gujarat plant (owned by Japanese parent Suzuki) should ease the capacity constraint and help tap the underlying demand. After the launch of Nexa-branded showrooms for distribution of premium cars in July 2015, the share of premium models in the company’s product mix has increased from three per cent in FY15 and eight per cent in FY16 to 21 per cent in FY17. The company sells the Baleno, Ciaz, S-Cross and Ignis from Nexa dealerships. The higher sales of these vehicles has also rubbed off on its market share, up by 60 basis points (bps) to 47.4 per cent in FY17. Incremental growth is expected from new vehicle launches and refreshes of existing models in FY18. After launching the new Dzire in May, the company will be introducing the new Swift, Vitara Brezza petrol, and a variant of the S-Cross in the current financial year. Over FY17-20, the company expects to keep the growth momentum by launching two new models annually. Analysts point to a couple of factors that helped the company improve its operating profit margin from 14.7 per cent in FY15 to 16.9 per cent in FY17. 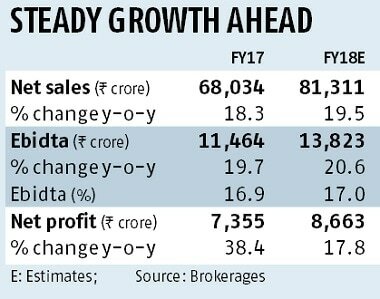 High levels of localisation, an improving product mix in favour of premium vehicles, which command higher margins, and favourable currency have boosted profitability. Analysts expect the operating leverage from higher volumes and utilisation of the Gujarat plant, beside the reasons mentioned earlier, to lead to a further increase of 60-70 bps in margins. 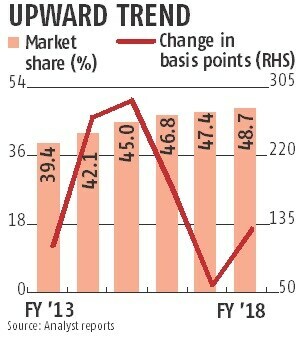 While business prospects, profit margins and earnings growth reflect the dominance of the passenger car market, the valuation (given the steep run-up in price) at 21-22 times its FY19 earnings estimate is at over a 30 per cent premium to its historic average. However, Chirag Jain of SBICAP Research believes the premium valuations will sustain as the company’s launch pipeline, improving competitive positioning and robust order book from recent launches lend high visibility to earnings growth. This, coupled with strong free cash flows, high return ratios and higher dividend payouts would help sustain premium valuations, compared to historical levels. Though not a threat in the medium term, the demand for environment-friendly technology is a key risk for the company. Its parent, Suzuki, does not have a hybrid, electric or fuel cell in its product line. Analysts, however, say the partnership with Toyota, announced earlier in the year, could help it to overcome this technology hurdle.